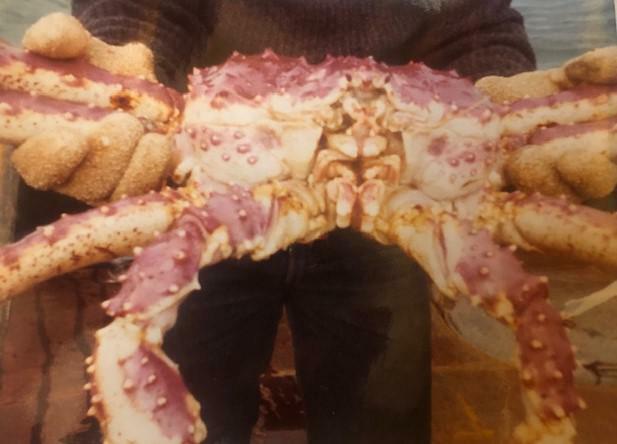 Mike DeVaney's photo from the 1980s of someone holding a king crab. Credit Courtesy of Mike DeVany. Kachemak Bay was once abundant with crab, shrimp and other shellfish species. But by the early 1990s, populations hit rock bottom. Now, a scientist and a college student are hoping to find out more about what happened. But they’re not looking for clues in the water. They want to hear from fishermen and those who were in the fishing industry at that time. DeVaney said fishing in Kachemak Bay was good up until the 1990s when stocks completely crashed, but he said the fishermen could see signs that shellfish populations were on the decline long before then. There are a ton of theories about why shellfish have mostly disappeared from Kachemak Bay ranging from the rise of salmon hatcheries to ecological changes. For DeVaney, he thinks that fishermen were part of the problem. These are the type of stories that Kris Holderied wants to hear. She’s the director of the National Oceanic and Atmospheric Administration’s Kasitsna Bay Laboratory based in Kachemak Bay. Holderied and a Kachemak Bay College student, Jill Burnham, plan to host small group conversations with fishermen and those who worked in and around Kachemak Bay shellfish fisheries. They may eventually invite community members to join in on the conversations and may kick off a future discussion with a live storytelling event. “Just kind of share both what's known, what's not known and then hopefully get this sense of what are the things that we can do together to help either conserve the things that we have or maybe bring back some of the things that we would like to have,” she said. Holderied said there are signs that small comebacks for some species are possible. Tanner Crab populations have increased in recent years, giving birth to a small recreational fishery for that species. And she said people want to know whether other species like shrimp or Dungeness crab could also return to the area. He said he’d love to fish again for crab but isn’t holding his breath for shellfish populations to grow enough to become commercially viable once again. Sport and subsistence fishermen around the Kachemak Bay area will be able to target tanner crab for the first time in four years this fall. The Alaska Department of Fish and Game received permission from the state Board of Fisheries to reopen the fishery this spring, and the crabbing season will open in October. Sport and subsistence crabbing in Kachemak Bay, along the outer coast of the Kenai Peninsula, and in Cook Inlet has been closed for about four years.